Summer started with a big surprise for Birmingham teen Ben Gretchko, who's suddenly ultra-popular on YouTube. 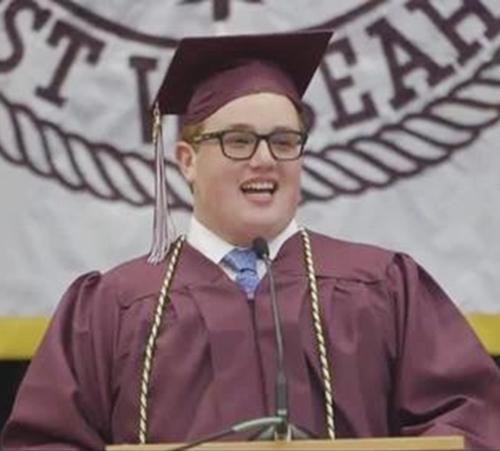 A four-minute video (below) of his address to fellow graduates at Seaholm High has been played more than 1.7 million times in just over two weeks. "I thought it would be an inspiring speech. What is a surprise is the fact that I got [so many] views," Gretchko tells WXYZ, which names the new grad Person of the Week because of "his inspiring message of acceptance." Ben Gretchko: "I’m a regular kid just like all of you." The 18-year-old, one of four student speakers at the June 4 ceremony, has autism. His message is to appreciate and support people with special needs. “Your acts of kindness can and will make a huge difference in the lives of others -- just as they made me the person I am today," he says on stage. His remarks were videotaped by The PLAY Project of Ann Arbor and put on Facebook by a New York nonprofit called Autism Speaks, which has 1.6 million followers on the social site. That June 14 post is shared nearly 24,000 times, has more than 1,000 comments and is on pace to reach 2 million viewings. Elementary schoolmates were among the Seaholm seniors, as Gretchko mentions: "When you – my classmates – were asked to help me grow by playing with me on the playground or explaining why a joke was funny, you stepped up to that challenge and helped me feel accepted. . . . Through all my speech issues and learning issues, I’m a regular kid just like all of you." He also salutes third-grade teacher Stacey Raznick, who was in the audience, and other Birmingham Public Schools educators: "Thanks to their dedication and hard work with me, I got into four universities. I’m actually going to Western Michigan University." To prepare for freshman year in Kalamazoo, the suburban Detroit teen is at a six-week transition program there for college students with autism..